It seems that another cloud mining operation is having trouble to keep running, this time because of mining hardware stolen by one of the partners. We are talking about the Chinese mining mega farm AMHash, a partnership between ASICMiner, RockMiner and Havelock Investments. You would expect that when ASIC manufacturers start their own cloud mining operation it should be reliable and secure and have no trouble, but apparently not if these are Chinese companies as it turns out. Throughout February some people started reporting that they are not getting their payments sent for the hashrate they have in AMHash. The apparent reason was due to the long New Year holidays in China, but it turns out that it was way more serious than that, but AMHash just recently at the last day of February explained the actual reason. 1. Dividends will be restarted in 24 hours as soon as ASICMINER sending us BTCs. 2. Dividends will be paid from 8th Feb and all missing dividends will be included if we get the payment. 3. Trading of AMHash1 on HAVELOCK will also be suspended until the dividends restart. 4. Any third-party platform collapse will be handled in the same way as hashie.co, AMHash will complete the hashrates transferring and subsequent dividends. We are still in active communication with ASICMINER, please be patient,and we will update in time if we get any new information. And a bit later another post detailing the actual reason why the payments from ASICMINER have stopped appeared yesterday also posted on the Bitcointalk forum. The 3.546PH AMHash’s hashrates have disappeared since 25th Dec 2014. We found this problem two days later, we asked friedcat, he said it was mining farm’s maintenance issues, hashrates would come back soon. But one week later,hashrates didn’t come back yet. When we asked FC again, we were told that all mining devices were robbed by the partner of the mining farm. And all hashrates were out of control. After then, FC told us that hashrates from new mining farms will be deployed, but we didn’t know the amount at that time. Right now, we still don’t receive any update from those new hashrates. Things are definitely not looking good for AMHash and for their customers, but we still need to see how they will handle the situation as they previously had some trouble with other partners and they have managed to do things right. 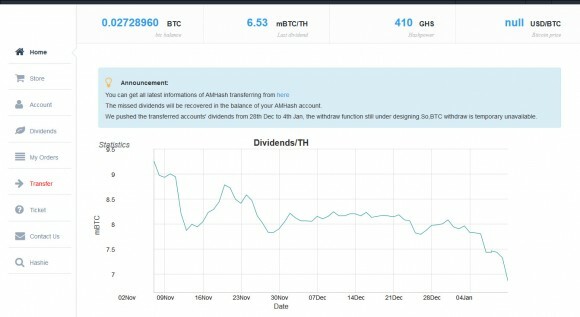 We are going to keep an eye on how the situation develops as we also do have some hashrate in AMHash and we have not yet received any dividends from mid February until now. 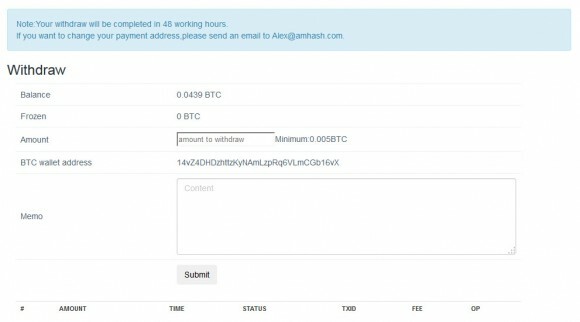 AMHash has added the ability to withdraw the dividends that you get for cloud mining hashrate that you have purchased from the service or have moved hashrate purchased at Hashie. The withdraw functionality is apparently confirmed manually before the request gets approved and currently there is up to 48 “working hours” time for approval or with other words it can take quite some time. The minimum you need to have in your balance to request a withdraw to your wallet address is 0.005 BTC and there is nothing mentioned about a fee. We have verified that currently smaller withdraw requests seem to be sent without a fee – the 0.0439 BTC that we have accumulated for the time that our hashrate has been moved to AMHash. With this the AMHash service now can pretty much sell their cloud mining hashrate directly and users will be able to use the service’s web-based control panel and not have to rely on other companies to provide such functionality such as the failed Hashie. However there is not information on new cloud mining hashrate being available from the service soon for purchase and with the current market situation and low Bitcoin price it may take some time before the investment in new mining hardware becomes viable. 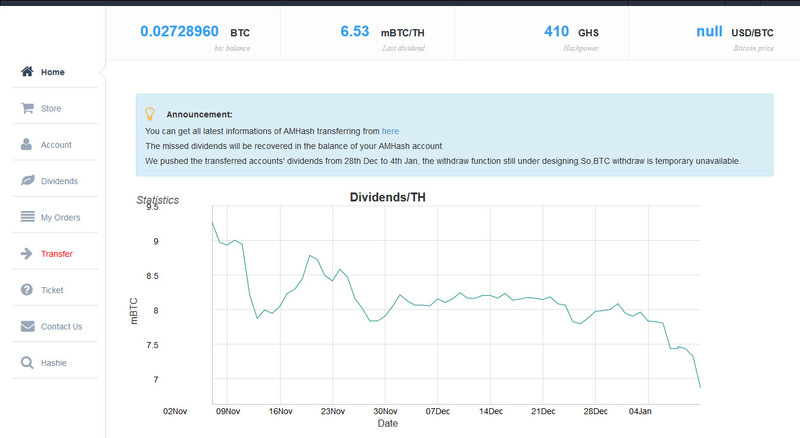 The new AMHAsh interface now has the BTC balance showing for the hashrate that has been transferred from the Hashie cloud mining platform with dividends getting calculated for users starting from December 28th. You can already see the BTC balance in your account, but the withdraw functionality has not yet been implemented, though that should most likely be available in the next days as well. Do note that the AMHash web interface was a forced a bit by the issues that Hashie had, so it is apparently currently being worked on the go and we are seeing improvements as functionality is being added. Do note that AMHash is currently not selling Bitcoin cloud mining hashrate, but their new web-based interface should support that functionality as well, so you should be able to purchase directly through it if/when they add more mining hardware to their mining farm. 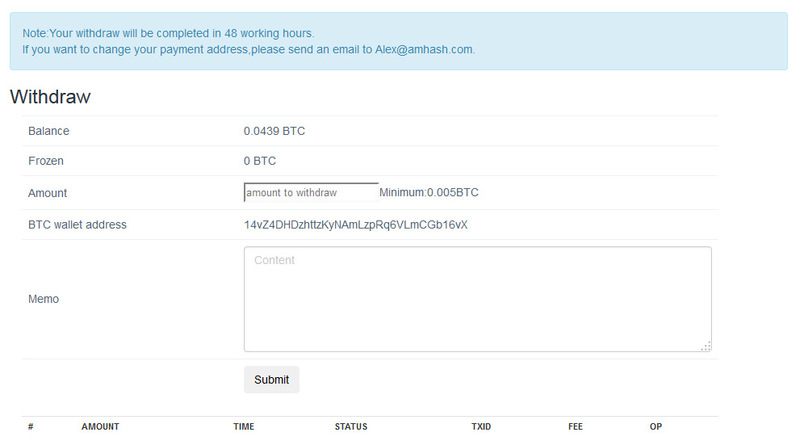 And if you still haven’t transferred your AMHash hashrate from Hashie, then you should initiate the transfer process.